Married to Chelsie (Burkhart) Addington-Strapp. Our first child, daughter, is due February 2019. Even though we didn’t win the game, which creates quite the bitter taste in my mouth even talking about it, the state title game my sophomore year was very memorable. The fondest of memories I have playing football at DeSales would have to be the moments prior to game time. The anticipation, the time before the first collision, and the slow build of emotions approaching kickoff with my best friends knowing we were about to go out and fight together for one another. 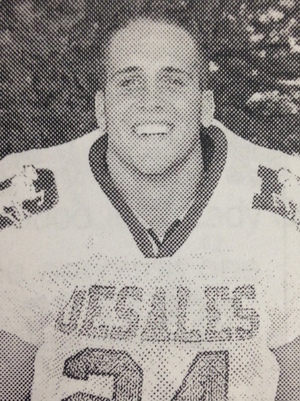 Playing at DeSales was special for me because it meant a selfless approach to the game. We always knew we had a responsibility to those who came before us to play with great effort and intenisty to uphold tradition, to honor our school to play with the utmost class, and play with great passion and love that I felt we owed to our principal, Pat Rossetti, our coaches, our families and perhaps most importantly at the time to one another. What was it like playing for Coach Jacoby? Playing for Bob Jacoby meant you were going to play with toughness and always fight to keep the winning tradition alive. I couldn’t tell you statistically. That seems like a question better suited for Coach Wiggins. If I had to choose one that sticks out in my mind it would be St. Ignatius my senior year. We won the game, which made my efforts worthwhile. I follow my favorite Stallion in all walks in life, Faith Ann Strapp.